Research – Erin P. Riley, Ph.D.
My research is field-based, multi-sited, collaborative, and primarily international. I am primarily interested in primate behavioral flexibility, how humans fit into a broader primate community ecology, the causes and consequences of ecological sympatry between humans and other primates, and what human-primate relationships tell us about what it means to be human and what it means to be a primate. 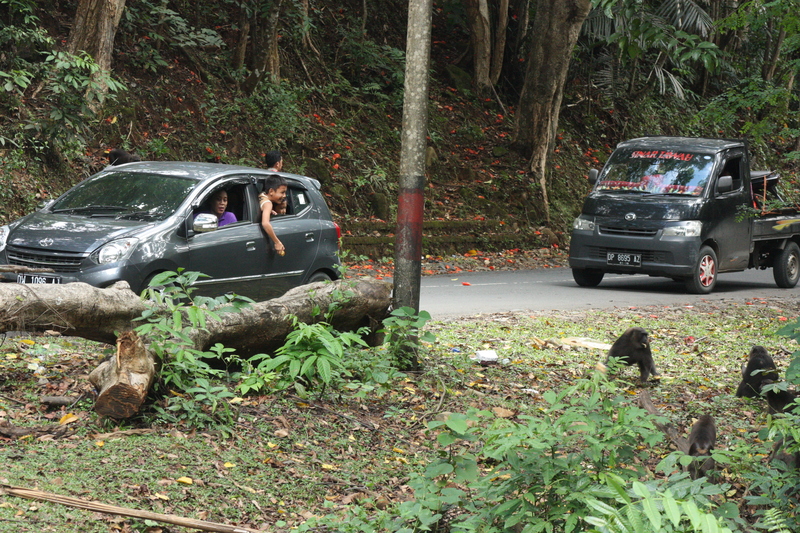 One of our moor macaque study groups in Bantimurung-Bulusaraung Natinonal Park (TNBABUL) has been habituated to human presence for many years due to occasional provisioning by park staff and regular following by researchers, but it has never been observed interacting with people traveling on the provincial road that intersects the park. Recently, though, we have observed the study group now spending a considerable portion of the day along the road, with some individuals accepting food from people and foraging in trash pits. With seed money from SDSU’s University Grants Program and the President’s Leadership Fund, my graduate student, Kristen Morrow, and I are utilizing this recent change to explore the influence of life history and social network factors in driving human-macaque interactions. This project will improve our understanding of not only how nonhuman primates adapt to anthropogenic pressures but also why they adapt in the patterns we observe. It will contribute to a growing body of research focused on how roads, an increasingly pervasive element of anthropogenic infrastructural expansion, affect wildlife and ecosystems. Crop feeding (or crop raiding) – the consumption of cultivated foods produced in agricultural areas – is an increasingly common response by wildlife to anthropogenic habitat change, and is particularly pervasive among primates. Because of the detrimental impact crop raiding can have on human livelihoods and the likelihood of local support for conservation efforts, crop raiding by primates has become one of most serious challenges to primate conservation. 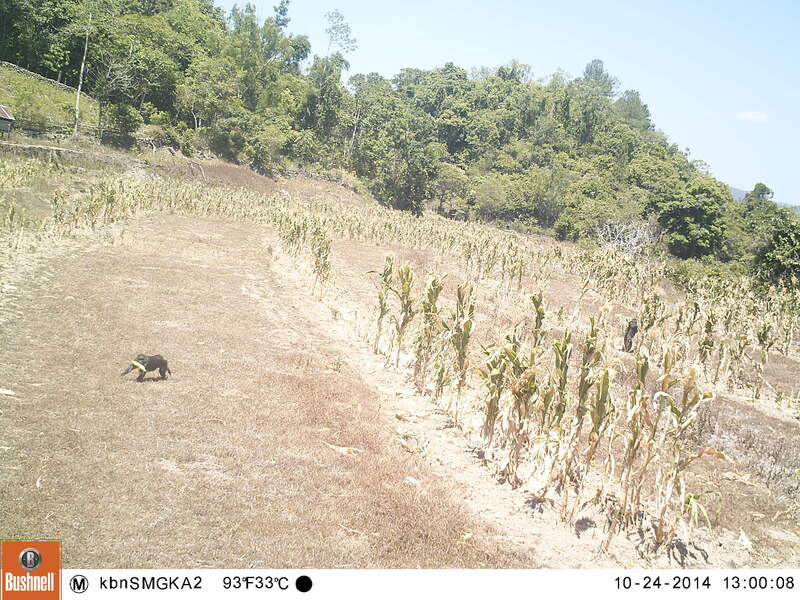 With funding from SDSU’s University Grants Program and the American Institute for Indonesian Studies (AIFIS), my graduate student, Alison Zak, and I are addressing this growing concern by integrating ecological, nutritional, and ethnographic analyses of the causes of crop feeding behavior by moor macaques (Macaca maura), an endangered primate species endemic to Sulawesi, Indonesia. 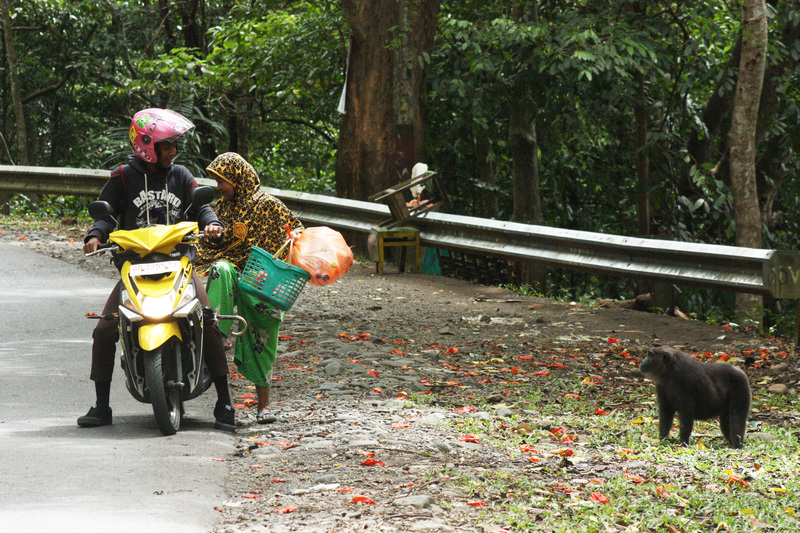 The results of this project will inform the development of crop raiding mitigation strategies for rural farmers across Sulawesi, Indonesia, which if successful, will increase local tolerance of the macaques and contribute to their long-term conservation. This project examines a facet of the human-primate interface that remains largely unexplored from an ethnoprimatological perspective: habituation. Defined as the process by which wild animals accept human observers as a neutral element in their environment, habituation is one of the hallmarks of field primatology. Although primatologists have explored how to accomplish habituation, little attention has been paid to habituation as a relational and mutually modifying process that occurs between human observers and their primate study subjects. With funding from the Wenner-Gren Foundation, my graduate student, KT Hanson, and I are using a hybrid methodology, integrating ethology and ethnography, to examine the habituation of moor macaques (Macaca maura) as both a scientific and intersubjective process. We hope to encourage the practice of a more reflexive primatology, create new space for intellectual exchange across the subfields of anthropology, and contribute to our understanding of human-animal commonality and continuity. 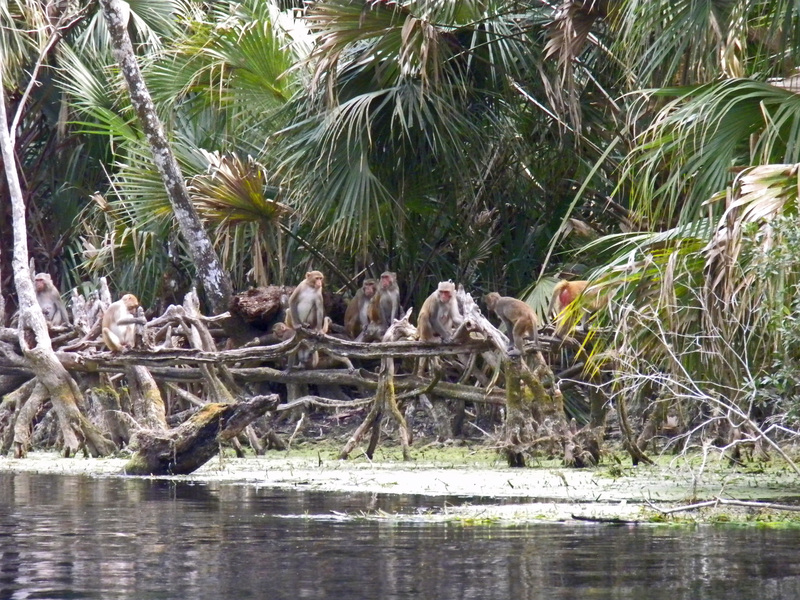 Beginning in 2012, I have been conducting research on the interface between boaters and a free-ranging population of rhesus macaques (Macaca mulatta) along Florida’s Silver River. This project, supported by a National Geographic Society/Waitt grant, is a cross-disciplinary research endeavor involving primatologists, cultural anthropologists, and environmental anthropologists. Our goal was to take advantage of the unique opportunity presented by the historical introduction of Asian rhesus monkeys to the riparian woodlands of north central Florida to study primate ecological and behavioral flexibility and the nature of interactions human and nonhuman primates in the U.S. wilderness. To date, my graduate student, Tiffany Wade, and I have collected data on the current population status, feeding ecology, and the nature of human-macaque encounters along the river. This project not only contributes to our understanding of primate ecological flexibility but also provides critical data needed for the management of the human-macaque interface.